Squash! In the name of love! 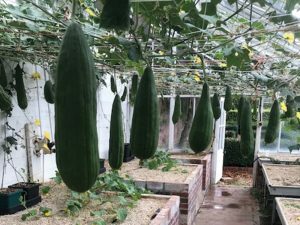 Like all the best affairs the cultivation of Dale Toten’s giant squash at Ston Easton Hotel has involved some steamy and torrid liaisons of late. Since we visited Ston Easton Hotel in May the squash, irrigated in it’s bed by AQUAbox Spyders, has bounded along. However it’s progress and efforts to tend it have been challenged by the recent climate. 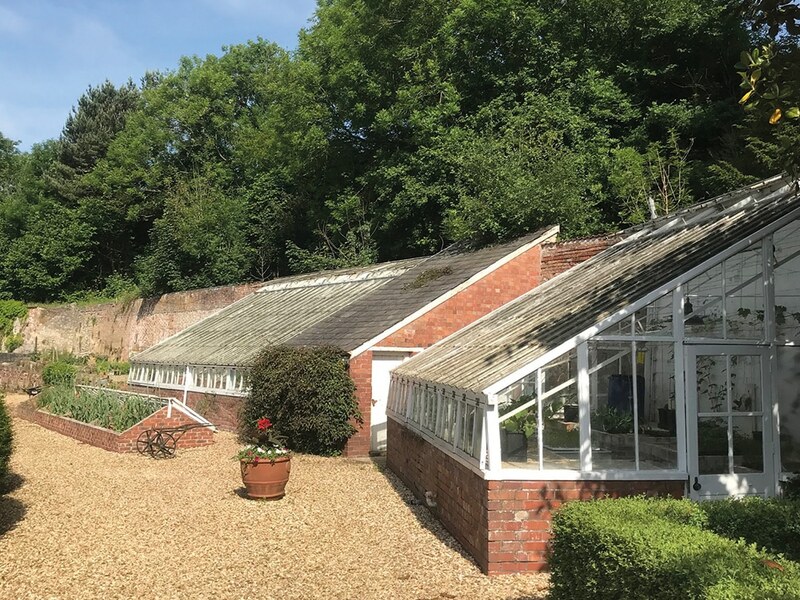 This summer’s piping hot weather, with outdoor temperatures consistently in excess of 30 degrees, has made the atmosphere in the greenhouse almost unbearable at times. The plant has, in truth, been struggling a bit. Venting and fans have been used throughout, and the Spyders have provided constant, responsive, deep level irrigation which Dale credits with having preventing the plant from cooking. Some of the older leaves have been aged quite a bit by the heat and this in turn has led to far slower growth rates on the fruit than Dale would have liked. Though servicing this squash has becoming rather a sweaty indoor sport you can leave your racquets, rallies and goggles at home if you’re thinking of visiting. At 450lbs the only court this gigantic orb will be knocking around is that of popular opinion, perhaps the court of giant veg growers, maybe the court of the king. Whilst 450lbs is undoubtedly heft par excellence Dale has one eye on the future when its comes to record breaking and rates the experience gained from this year’s grow as the most valuable thing to take away. This is only the first year in which Dale has adopted AutoPots for growing and he sees plenty of scope for adjustments in order to grow even bigger and better crops. Though he is keen to tweak extensively in the future Dale reports being deeply impressed by how such big plants manage to continue to grow so strongly without visibly irrigating. Also high on on his list of praises is the fact that weeds are far less of a problem due to the upper and surface layers of the substrate staying drier. Elsewhere in the greenhouse there’s great news for those amongst you who like to wash! Dale’s loofahs have been positively basking in the heatwave. Here Dale reckons the 1Pot Systems have dealt him easily his biggest ever crop at this time of year with fruits beyond all expectation.